Over one million recipes on/line! *This new website has search features such as recipe ranking, shopping lists, save to cell phone, and more! Sorry, but the database registration is currently closed to new users. 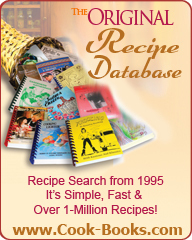 Feel free to browse our free cookbooks.com Highly Rated Recipes! Copyright© 1996-2018, All rights reserved Cookbooks On/Line, Inc. Cookbooks On/Line is a registered trademark of Cookbooks On/Line, Inc.